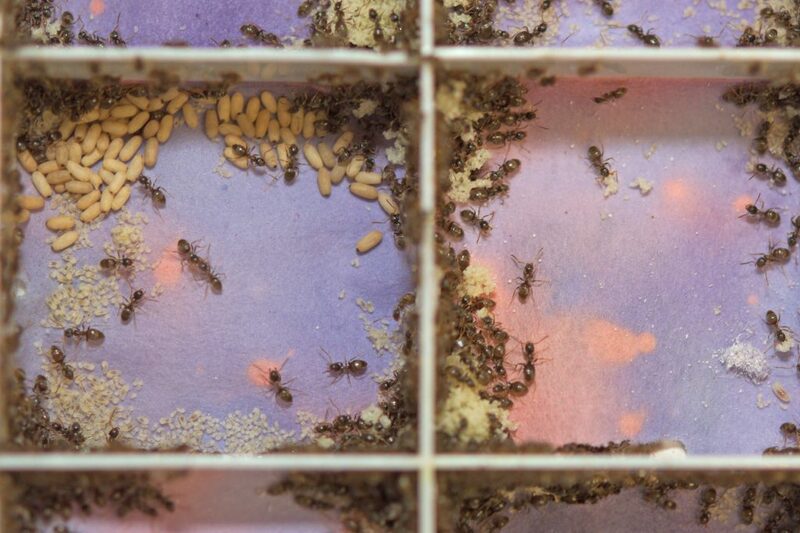 Ants are neat: when they move into a new nest box, they spend the first days cleaning it thoroughly, like us humans getting out the cleaning bucket when moving into a new home. Despite keeping the nest clean, using poison within the nest is dangerous and can kill unprotected brood. However, the silk cocoon that surrounds the ant’s sensitive pupae protects them from any harmful effects, as Sylvia Cremer from the Institute of Science and Technology Austria (IST Austria), and her team, including first author doctoral student Christopher Pull – now a postdoc at the Royal Holloway University London (RHUL) – show in today’s edition of Current Biology. Many ants produce highly acidic chemicals from specialized glands in their body. For a long time, researchers assumed that ants only spray this poison, which is made mostly of formic acid, to fight other ants and would-be predators. But in two studies published in 2013 and 2018, Sylvia Cremer and her team showed that ants use acidic chemicals to disinfect nest-mates contaminated and infected with pathogens. In the current study, published by Pull et al., Cremer’s research team show that Lasius neglectus ants also spray their nests prophylactically with their acidic poison, likely ensuring that the nest is clean for first-time occupancy. But, given the poison doubles-up as a chemical weapon, the use of the poison within the nest raises further questions, as Sylvia Cremer explains: “How can ants spray this aggressive acid in their nest, whilst leaving their sensitive brood in the acidic fog?” Whilst adult ants are protected from the poison by a thick skin (the cuticle) and eggs by a protective “shell” (the corion), the cuticle of the pupae is thin and fragile, and so very susceptible to damage. However, pupae of the Lasius neglectus species are also covered in a silk cocoon, which Pull et al hypothesized may offer them protection. The current study provides the first example at colony level of so-called immunopathology, a phenomenon also known from the human immune system. The immune system often fights pathogens with toxic substances, but at the same time, it must limit damage to its own body cells. The immune system, therefore, faces the challenge of fighting pathogens as aggressively as possible, while protecting the body’s own cells and organs from collateral damage. The same happens in ants on the colony level: they protect the most sensitive parts of their colony from the harmful side effects of cleaning with a caustic poison.